Museum Technician Jennifer Stringfellow adjusts Sally Ride's STS-7 in-flight suit for display in the mock-up Discovery mid-deck in the Moving Beyond Earth exhibit. Museum staff members work on preparing artifacts and storage areas for use in the mock-up Discovery mid-deck in the Moving Beyond Earth exhibit. Astronaut Sally K. Ride wore these clothes during the six-day STS-7 Space Shuttle mission aboard Challenger in June 1983, when she became the first U.S. woman in space. 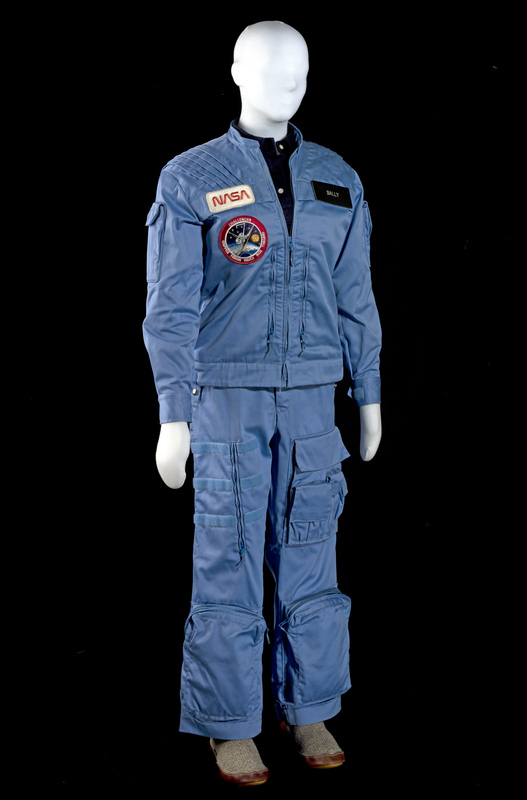 Astronaut Sally K. Ride wore these clothes during the six-day STS-7 Space Shuttle mission aboard Challenger in June 1983, when she became the first U.S. woman in space. As a mission specialist in the first five-member Shuttle crew, she operated a variety of orbiter systems and experiment payloads. She participated in the launch of two commercial communications satellites and also operated the remote manipulator system arm to maneuver, release, and retrieve a free-flying satellite. The early Shuttle mission astronauts had a NASA-issued wardrobe of identical blue cotton-blend jackets, trousers, shorts and knit shirts with attached NASA logo and mission patches. Dr. Ride presented her in-flight suit to the Museum in a ceremony shortly after the STS-7 mission. Sally Ride was the first American woman in space. She was a mission specialist on the seventh space shuttle mission and operated the shuttle’s robotic arm. Ride was known for her friendly and relaxed personality, but also her intense focus. She felt responsible for paving the way for women in space. Ride’s performance and skill, alongside her four male colleagues, made her a symbol of equality.